Below are several images of the Dawson Family home in Corry, Pennsylvania. The early panorama illustrations are from wall maps of Corry downloaded from the Library of Congress American Heritage Web site. The other two photos are courtesy of the Corry Historical Museum. Click on each of the photos for an major enlargement. Most of the files are approximately 90 kilobytes and should not be a problem for those with dial-up connections. A panorama view to the South from the North side of the railway tracks. The family business, Dawson Brothers Grocery store was a block away on North Center Street in the central business district. 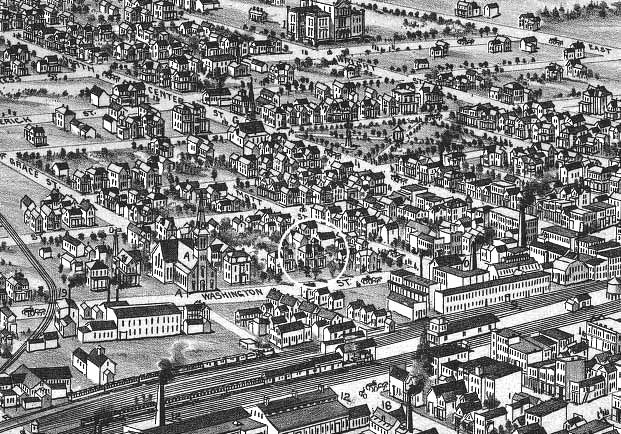 Notice the oil and kerosene manufacturing plant (Downer Oil Works) across the street and the railway yard just one more block away. The neighborhood must have been smelly and noisy, but it was convenient to work, shopping, school, church and public transportation. Some pretty nice homes were built along this street. "The fine old Dawson estate on West Washington street, just off Center is offered for sale for $5,000, large 12 room house, a small house, barn and large lot with 110 feet frontage, on paved street, two baths, fine basement and lawn." Panorama view looking North from the other side of the tracks. 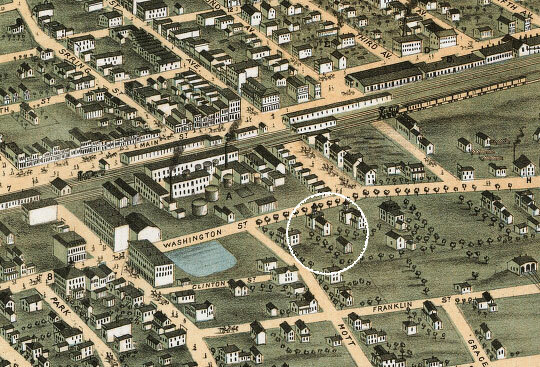 Notice how the town has grown and so has the scale of the houses in this rendering. The Dawson Brothers grocery store is now occupying 43-45 North Center Street. The family attended Emanuel Episcopal Church (G) two blocks to the right and three towards your vantage point. In 1913, the house was sold on the death of Alzina Hall Dawson, the surviving widow of Richard P. Dawson. Within a few years, the house became the home of Mrs. Eva Rich (1917-1918 ), and eventually the Rich Cancer Cure, Inc.was founded here and survived until 1927. Compare this image with a photo from Lula Dawson Bliley's summer party in 1898. "This home, which is no longer standing, was located at 117 West Washington Street and was thought to have been built by former city councilman (1890s) and Mayor (1900 - 1903) Richard P. Dawson. The house had many owners prior to being torn down. In 1910 this was the residence of Mrs. R.P. ("Allie") Dawson. Later, in the 1917-1918 time period, it became the home of Mrs. Eva Rich, and eventually the Rich Cancer Cure, Inc., which moved its clinic there from an East Main Street location. By 1927, the Besson Family was residing in the house. It remained the Besson home, with the Bessons renting some apartments in the large house, until the mid-1950s when it was sold to the A&P Grocery Company. A&P tore down the house and built a store on the lot. A&P vacated the store around 1970 to move to a location in the West Smith Street Plaza. The building remained vacant for a time and was then purchased by Ajax Iron Works to use as a drafting office. After Ajax closed down, the building again sat vacant until it was purchased by the Corry Public Library in 1996 and after renovation and new construction, transformed the property into the city's new public library." 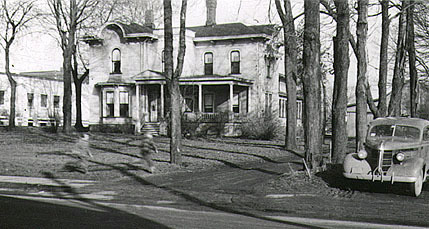 The home was most likely built by the Dawson Family. There are several photos of the the house in my grandmother's personal family photo album, she created in the early 1930s. None of these show major portions of the house. See album pages: 7, 11, 23, 42 & 47. Look in the Library of Congress' fantastic "American Memory" Map Site for the panoramic map resources. Search on the words: Corry PA or whatever places in which you may be interested. While your are there, look at the other sections of this site. If you love maps and history, you will not be disappointed. This site and associated pages are Copyright 2001, by Charles A. Bliley,. Pittsford, NY, U.S.A.